The Rio Grande runs through several beautiful canyons where both peaceful floats and exciting rapids can be found. One of the best rivers in the Southwestern U.S. for extended canoe trips, let our experienced staff introduce you to its hidden treasures in a more intimate setting; great camps, awe-inspiring side hikes and customized itineraries. 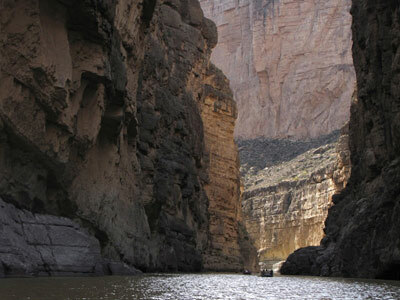 We offer canoe and raft trips in the canyons of Big Bend Ranch State Park and Big Bend National Park as well as the Lower Canyons section of the Rio Grande Wild and Scenic River. You’ll find leisure and scenery punctuated by a few intriguing rapids on this reach of the Rio Grande in West Texas. The rapids vary according to the amount of recent rain, but under normal conditions, they range from class I-IV. As with all of Desert Sports’ guided trips, great food, informative guides, and unique itineraries are part of the package. Each extended trip has a custom menu to make sure we can accommodate any special dietary needs of your group. All our trip leaders are guides with years of experience leading tours on the Rio Grande. We specialize in keeping our trips small, allowing us to pay closer attention to the details that make your experience more rewarding and complete. Desert Sports’ livery includes canoes, inflatable kayaks and rafts, along with all the accompanying gear for safe and comfortable camping trips. Can’t make the minimum number for booking a trip? Check the Scheduled Tour Postings or contact us with your dates and we will try and put you together with other folks to meet the minimum booking requirements. You’ll want to add more days as you find the rhythm of the river. Enjoy camping under the stars and hiking through the desert while you explore the canyons of the Rio Grande. Desert Sports offers one-day and multi-day options on this very popular section of river. The first part of this trip meanders through scenic low mountains, bluffs and washes before entering the dramatic cleft in the limestone mesa that is Santa Elena Canyon. The trip descends into the depths of its 1500-ft canyon walls and the notorious Rockslide Rapid. On multi-day trips there will be time for exploring the canyon further, as well as relaxing around camp. After 8 miles of awe-inspiring canyon, the trip emerges into the open with a dramatic view of the Chisos Mountains as the trip winds towards the take-out near Castolon. Our Santa Elena Canyon upstream canoe trip is a low-water opportunity to visit one of the major limestone canyons in the Big Bend National Park. The trip starts at the Santa Elena hiking trail, where we carry our boats to the river and paddle upstream with stops for exploring and a picnic lunch. Overnight trips leave more time for exploring and our three-day upstream excursion allows an opportunity to visit the famous Rockslide Rapid. The river from the end of Santa Elena Canyon to the beginning of Mariscal Canyon is seldom traveled, thus the name “The Great Unknown”. Our trip continues past this section through the marvels of Mariscal Canyon, San Vicente Canyon and Hot Springs Canyon as we enjoy vistas of the southern ridge of the Chisos and numerous other mountain ridges in the Mexican Reserves to the south. A full seven days of relaxation, this is truly a trip for those who want to get away and escape the crowds. The most remote canyon in the national park, in Mariscal the river forms the bottom of the “bend” of Big Bend. Access to this canyon can be difficult but well worth the effort. The sculpted limestone walls rising 1,800 feet above the canyon floor give the night sky that “river of stars” look from our camp on the banks of the Rio Grande. The three-day itinerary takes in the seldom seen canyons of San Vicente and Hot Springs, which we pass on the way to our take-out at Rio Grande Village. Boquillas is the longest, most varied canyon in the national park. The river has cut its course through the Sierra del Carmen, creating magnificent views into both Texas and Mexico. Desert Sports offers Boquillas Canyon trips with either three or four-day options. Both are peaceful and relaxing, but the four-day itinerary, allows even more time for relaxing or exploring the back country and interesting, side canyons along the way. Longer trips available. The combination of these two great canyons allows ample river time to enjoy over 60 miles of river running. The trip takes us through four different canyons (including San Vicente and Hot Springs Canyons) on our way to the take-out at Heath Canyon Ranch. Temple Canyon was named by Robert Hill on his historic 1899 expedition down the Rio Grande. This 11-mile trip takes us through several beautfiul limestone canyons as well as some of the most spectacular vistas in the Big Bend region. We come off the river at Maravillas Creek and get to enjoy a peek at the scenery of the seldom seen Black Gap Wildlife Management Area.